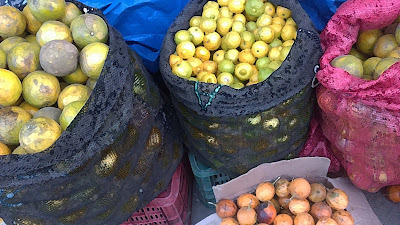 Fruit in Otuzco is good and cheap. People bring fruit here from different areas. In the summer, big trucks bring mangoes from the coast. The mangoes are so big that two can easily weigh more than a kilo. The trucks park by the market and sell five mangoes for 1 sol. I could not believe they were so cheap the first time I got some! In the winter, there are a lot of oranges. My favorite oranges are the local ones, the ones grown in a nearby valley. They are called naranjas serranas. They are really good to make orange juice. You can buy 8 for 1 sol! Generally, good fruit in Lima is not so cheap. Today, I want to thank God for the fruit I get here.